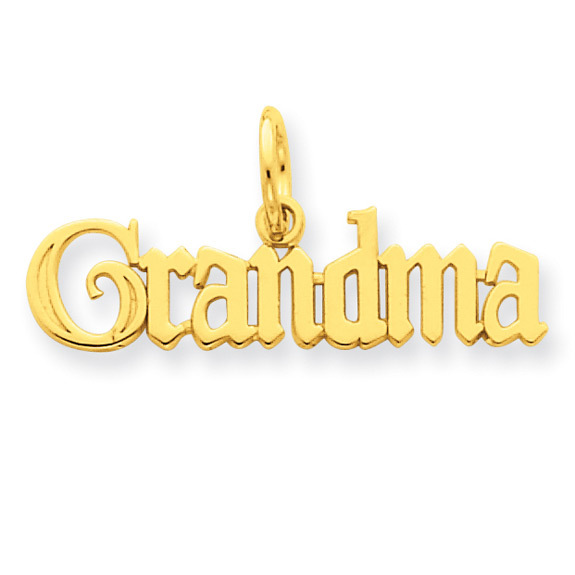 Grandma charm necklace pendant in our unique old-style font crafted from 14k solid gold, from Apples of Gold Jewelry. The grandma charm measures approx. 1" long x 1/2" tall (including hoop). This is a fully solid gold pendant, made in the U.S.A.! Add a matching 0.7mm box chain necklace in either 18" or 20" for grandma to wear this unique and sentimental necklace around her neck in the length of your choice. "And above all these things [put on] charity, which is the bond of perfectness" (Colossian 3:14). We guarantee our Grandma Charm Necklace, 14K Gold to be high quality, authentic jewelry, as described above.